The Loop is the central business district of Chicago and it is one of the city’s 77 officially designated community areas. 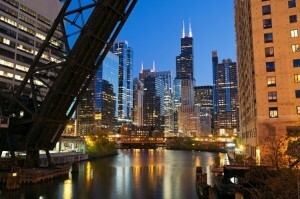 It is bounded by the Chicago River on the west and north, Lake Michigan on the east and Roosevelt Road to the south. It is believed “The Loop” terminology originated from the cable car turning loops in the downtown area and especially those of two lines that shared a loop bounded by Madison, Wabash, State and Lake. Other research has concluded that “The Loop” was not used as a proper noun until after the 1895–97 construction of the Union elevated railway loop. The Loop architecture has been dominated by high rises since early in its history. Notable buildings include the Home Insurance Building (considered the first skyscraper and demolished in 1931), the Chicago Board of Trade Building (a National Historic Landmark) and Willis Tower (the tallest in the United States). Chicago’s street numbering system which divides addresses into north, south, east and west quadrants, originates in the Loop at the intersection of State Street and Madison Street. As previously mentioned, the Loop is where seven of the eight CTA train lines converge. 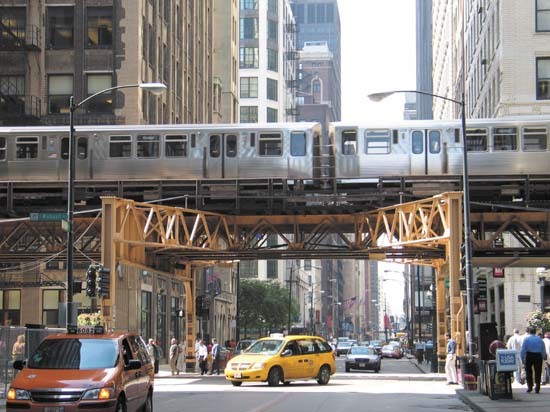 The Loop is bounded by the Pink, Orange, Green, Brown and Purple elevated train lines and cut across underground by the Red and Blue train lines. A multitude of buses run throughout the Loop and can take you from one side to the other of the Loop or all the way north through Lincoln Park and into Evanston, west or south in the City of Chicago. Parking is difficult but taxis are plentiful at any hour of the day. Chicago Public Schools serves residents of the Chicago Loop through various different zones of the school system. To find out which school your child would be elegible for, please check Chicago Public Schools. Many higher educational institutions are located in the Loop and include National-Louis University, School of the Art Institute of Chicago, Harold Washington College is a City Colleges of Chicago community college, Adler School of Professional Psychology, Argosy University, Harrington College of Design, Trinity Christian College, Spertus Institute and Meadville Lombard Theological School. The Loop is home to some of the best shopping in Chicago along State Street. It includes Chicago’s former Marshall Field’s department store location in the Marshall Field and Company Building (now Macy’s), the original Sullivan Center Carson Pirie Scott store location (now Target) and Sears on State. If you are in the mood from some cultural enlightenment, visit the Art Institute of Chicago, Chicago Symphony Orchestra, Lyric Opera of Chicago, Joffrey Ballet or find out more about Chicago at Chicago Cultural Center and Harold Washington Library. Check out a play or musical at any one of the fabulous theaters that are part of the Theater District including Cadillac Palace Theatre, Ford Center for the Performing Arts/Oriental Theatre, Goodman Theatre, Bank of America Theater and the Chicago Theatre, whose glittering marquee is one of the city’s most recognizable icons. The Chicago River, which delineates the area, also provides entertainment and recreational opportunities including the annual dyeing of the river green in honor of St. Patrick’s Day. Trips down the Chicago River including architectural tours by commercial boat operators are great favorites with both locals and tourists. Chicago’s lakefront, which is almost exclusively recreational park area from north to south, features Grant Park in this downtown area. Grant Park is the home of Buckingham Fountain, the Petrillo Bandshell, the Grant Park Symphony (where free concerts can be enjoyed throughout the summer), and Chicago’s annual food festival, Taste of Chicago. 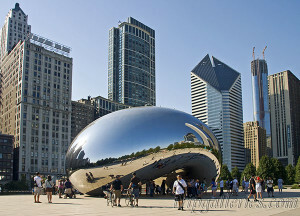 A recent addition to Grant Park is the architecturally forward Millennium Park, which opened in the summer of 2004, featuring a Frank Gehry’s Jay Pritzker Pavilion, Jaume Plensa’s Crown Fountain and Anish Kapoor’s Cloud Gate sculpture and spanning what were formerly open railyards on the city’s lakefront. The Loop contains a wealth of outdoor sculpture, including works by Pablo Picasso, Joan Miró, Henry Moore, Marc Chagall, Alexander Calder, and Jean Dubuffet. In the mood to celebrate? Check out Chicago Bluesfest (June), Taste of Chicago (July), Chicago Air & Water Show (August), Lallapalooza (August), Chicago Jazz Festival (August), Berghoff’s Oktoberfest (September), Chicago Marathon start/finish line (October) and Christkindlmarket Chicago (November/December) to mention a few. In what is now the Loop Community Area, on the southern banks of the Chicago River, near today’s Michigan Avenue Bridge, the U.S. Army erected Fort Dearborn in 1803. It was the first settlement in the area sponsored by the United States.